After You Vote For Us, Then Who Else Do You Vote For? 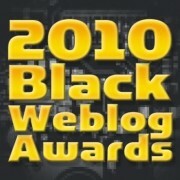 Much thanks to all of you who voted for SoulBounce during the nomination phase of the 2008 Black Weblog Awards. And now that we are in the finals for Best Music Blog and Best Blog Design, we hope that you'll vote for us so we can avoid nOva kirking out. But seriously, we kid. We do hope that you vote for us because we really do believe that there is no competition when it comes to bringing you the best that soul music, in all of its incarnations, has to offer. Butta: "What can I say about Afrobella that everyone who has visited doesn't already know? Afrobella touches on everything from hair and beauty to politics and music in a well-written, often witty, always thought-provoking way. I always leave with something when I visit this site." Harlem: "Yanni's Block is the first and only black soap opera written exclusively for the internets. The writers are extraordinary, spending the last six 'seasons' crafting three-dimensional personalities for the main characters--all of whom you'll feel like you've known forever. Prepare to be hooked from the first read..."
Butta: "Necole Bitchie brings the gossip but she isn't tacky about it. She's a decent writer and amusing in her own way." Butta: "If you don't laugh at something, anything at Fresh's Crunk + Disorderly, then you really need to check your pulse to make sure you haven't crossed on over to the other side. On C+D Fresh displays her brilliant mind with an irreverent, don't-give-a-damn sense of humor while sharing celebrity gossip, crazy videos, ridiculous fashion, and the meanest side-eyes this side of the Mississippi." nOva: "Clay Cane just lets it flow. He's provocative, hilarious, and intelligent. His Beyoncé posts are among the funniest things on the Internets." Butta: 'They still call him D-Nice because his photography is dat nice. He has a great eye and knows how to compose a striking photograph. Look at the man's pictures, then look at the competition's and you'll see that there is but once choice. " nOva: "Fave has been holding it down for a minute with a show that is insanely professional, funny and he truly represents GOOD music. I've been listening since he won the BWA judge's vote last year. 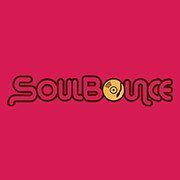 He's been a great supporter of SoulBounce ever since, but even if he wasn't, his output wouldn't be any less dope." ill Mami: I love Thembi's website with its exposure of folks behaving in less than appealing ways. But she also has a Fresh Black Girls feature which highlights some amazing women, as well as her post on "New Lady Laws For Black Women" which I found so necessary in these days and times." 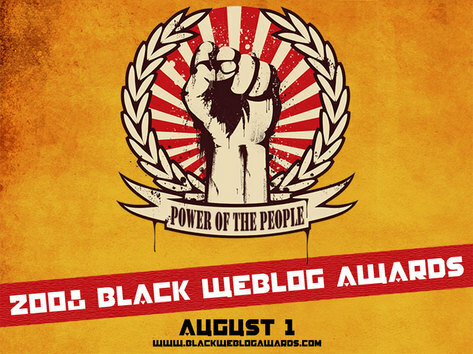 We hope that this will aid you in your quest to vote not only for us, but for some other great blogs out there as well. Remember voting closes August 31. That's in seven days, people! So make sure you represent like this is the November election. Yes We Can! I voted for Sister Toldja's blog http://www.thebeautifulstruggler.blogspot.com for best personal blog and best writing in a blog. I've been reading her for 2 years now and she is FABULOUS!! I love living vicariously through her clubbing, working, working out as a sassy sista in Brooklyn. Hilariously intelligent and a phenomenal writer. There is no competition when it comes to bringing music to the forefront. Songs In The Key of Life, your comrade, brings it hard as well but for some reason she didn't make it to the finals. So I take it that this win will be for the two of you. 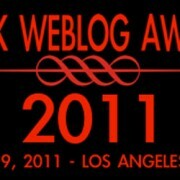 @ don...Totally agree with you that SITKOL shoulda been nominated for Best Music Blog alongside us.